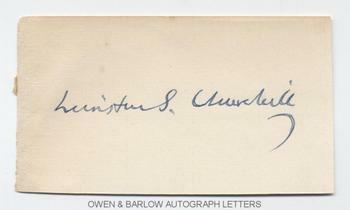 WINSTON SPENCER CHURCHILL autograph Signature. British Conservative statesman and twice Prime Minister (1940-45 and 1951-55). He was also a Nobel Prize winning writer, army officer, war correspondent and artist. Bold AUTOGRAPH signature on paper piece from an autograph book. Approx 4.75 x 2.75 inches. Fine. Winston Churchill, son of Lord Randolph Churchill and the American, Jennie Jerome, is one of the great figures of the 20th century. His early life as a soldier at the Battle of Omdurman and his adventures during the Boer War would have been remarkable enough, had he done nothing else. Rising from the political wilderness, he became the greatest war-time leader that Britain ever had and, arguably, one of the greatest in world history. His autograph, although not rare, is much in demand and is a cornerstone of any collection of 20th century historical AUTOGRAPHS.